Vodafone 555 Blue is the latest Facebook phone. Apart from the former ones this one from Vodafone runs its own operating system which is prepared in such a way that the user will be 24x7 live on facebook. The phone boots itself on for signing up to facebook, this doen't means that it lacks all other things that is needed for a phone but it is not fully true so lets Check the details of it. 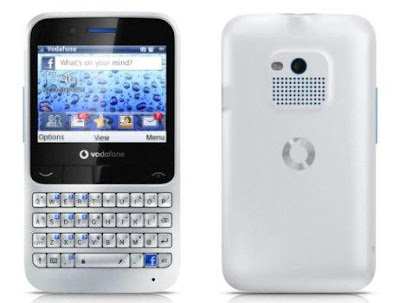 The Vodafone 555 Blue a 2.5G device comes with a 2.4" 320x240 pixel display with a QWERTY keypad, has a 2-megapixel rear camera with flash, 40MB in-built memory which can be expanded to 16GB. It has a dedicated Facebook button on the keypad. Other options of 555 Blue includes Bluetooth 2.1, FM radio, SD card slot, music player supporting MP3s, WMAs and AACs formats using built-in music software, earphone jack, dedicated button for accessing camera, Opera Mini 5 web browser, volume rocker on left-hand side. The Vodafone 555 is 12mm thick and will be available later this year. Currently no word about the price. 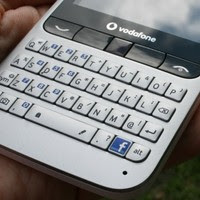 Tags:Facebook Phone, dedicated facebook button phone, Vodafone 555 Blue, Vodafone Blue, 555 Blue, Vodafone 555 Blue features, Vodafone 555 Blue specifications, Vodafone 555 Blue review, Vodafone 555 Blue details, Vodafone 555 Blue availability, Vodafone 555 Blue specs, Vodafone 555 Blue images, Vodafone 555 Blue pics, Vodafone 555 Blue pictures, Vodafone 555 Blue price, Vodafone 555 Blue cost.